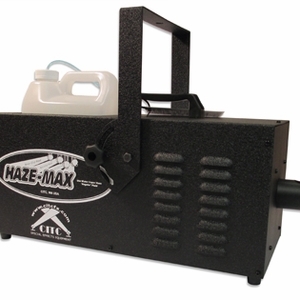 CITC’s Haze-Max with DMX is a professional, easy to use, reliable haze machine that produces a long-lasting, 30-minute, even haze from a water-based fluid without using any glycols or oils. Boasting no condensation or residue, this show-tuff haze machine works on professional stages around the world without ever clogging. No programming or special care required. Only a five minute warm-up, and you never need to change the heads. The Haze-Max comes with a 25' remote control cycle-timer, and has a one channel, 5 pin XLR on board with volume control. One year limited warranty when using CITC’s Water-Vapor Haze or Organic fluids. This wonderful workhorse continues to do its job for 10 years and keeps on working. It comes with a hanging bracket, so you can hang it and use it right away. Manufactured by CITC in the USA.